An apple or a pomegranate? Who knows who is using this logo? I then proceeded to add my own stamp to it (eurobt.net). Last edited by Montgomery Burns on Mon Dec 25, 2017 7:23 pm, edited 1 time in total. Maybe http://www.ibhinvestmentbank.com/contact-us.html IBH Investment Bank Ltd in Labuan, Malaysia? A black star with almost invisible a 4, through the 20. 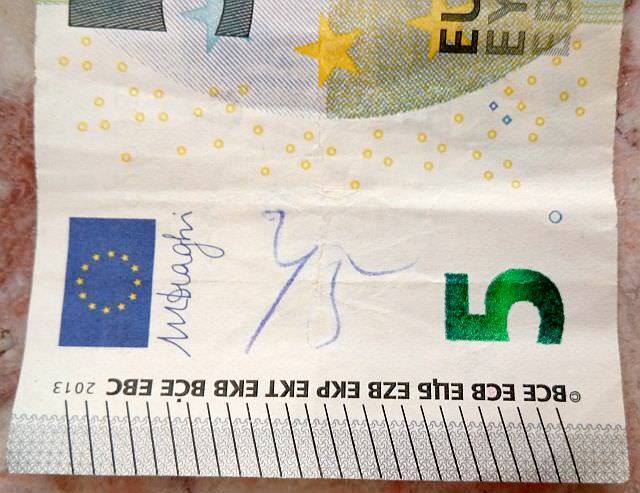 Today I found this curious 10 € Trichet note. It has a complete name and a picture on front side. No hit .